Is a device that makes it possible to heat the TEM-grid during observation inside the TEM. These special holders can usually go up to temperatures beyond 1000°C with make’s it pretty neat to study anealing, crystalisation and other related phenomena for metals or other types of materials. -The good’s, I acquried an used heating holder of Jeol fabricate and it fits our microscope, the 2000fx that is. -The bad’s, no manual, no power supply only the actual holder was devliered. 1. Use National Instruments PXI system as replacement for the missing power supply unit. +. This gives a bonus of complete integration to the rest of our system setup, sync with video recording, logging etc. Find out the cable configuration on the back of the holder. These holder’s usually contains a thermocouple (TC) to measure (two wires) the temperature and a filament (another two wires) to heat the sample with. In figure 2 below one sees a photo of the back of the holder, showing the connected wires from the grey cable that goes to the connector that fits in the power supply unit. An ohm meter will give you which wires belong to each other but to find out which pair is the thermocouple and which is the filament one need to measure the resistance temperature dependency of the pairs. I used the PXI system to measure the temperature dependency. In this case it was the RED and WHITE wires. This means that the remaining pair BLACK and GREEN are used for the filament. I decided to remove the old contact on the heating holder and replace it with a new one of Fischer type. Figure 1, the Fischer connector (103 type) that was assembled onto the heating holder cable. I search the Internet and found a paper describing that a similar holder used a thermocouple of PT-PT-RH(13%) combination, R-type that is. I quick test to see if this is also right for my holder was done. I measured the temperature using the R-type configuration of the thermocouple and melted a small piece of Indium metal that I have placed on the TEM grid. According to the temperature reading of the thermocouple, the metal melted at 155°C, table value states 156.6°C for Indium so this is within the error range and the thermocouple is most likely of R-type. 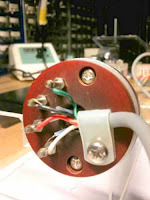 Figure 2, The back side of the heating holder RED, WHITE thermocouple and BLACK, GRREN heating filament. Just to mention som technical details about the temperature measurement. I use a PXI system with the National Instrument's PXI-6229 multifunctional M-series DAQ in combination with a SCB-68 connector block. This is a sleek setup for thermocouple measurements, the LabView software has preconfigured scaling for thermocouples, you just select which type you wanna use, and the SCB-68 connector block has built in cold-junction-compensation by utilizing a LM34 temperature sensor. Because the thermocouple is differential you easily get noise built up in the wires, so I soldered a pair of 10kOhm resistors from the thermocouple lines to ground in the connector box. A low-pass filter with cut of frequency of 4 Hz was also assembled in the connector box. For me this setup gave a signal that is stable to sub ±1°C. The heating of the filament also need's some signal conditioning setup. First a thought of using a power operational amplifier, but I find out that I already got a ULN2003, a driving stage, in my Racco box so that have to do. This drive-stage has seven channels that works similar to a relay, when a channel is activated on the drive-stage, by a digital TTL signal, it connects the signal to be controlled to ground. I configured all seven channels into a parallel resistors net, where the resistors where configured with the following values: 10, 20, 43, 89, 160, 320 and 650 Ohm. So what does this mean: If I activate the 10 Ohm channel I am sinking an high current due to the low resistance (hot filament) and if I activate a high resistance channel (less hot filament), a smaller current will pass to ground. Because all my seven channels goes through the filament and due to the neat chose of resistors (note the factor of 2x increase between each of them) I can control the heating power level of the filament in 255 step using a binary combination of all the channels. One thing to consider here is that you limit the heating current by using resistors, the driving stage can sink up to 500mA per channel, so this means that you could get up to 2.5 Watts of heat production in your 10 Ohm resistor, so have this in thought when choosing resistors. I choose a power resistor capable of handling 4 Watts for the 10 Ohm resistor channel, and the 20 Ohm resistor a choose two 1 Watts resistors in series. For the rest the power level is less than 0.5 Watts so for those the power levels are not a problem. The drive stage is supplied externally with a voltage source. Figure 3, The SCB-68 connector box with the extra electronics assembled. Top left you se the low-pass filter, (the blue capacitor and resistor) used for the thermocouple, below left is the Fischer connector that goes to the heating holder. The Fischer connector was chosen by me because the one that was on the heating holder was of some old model. To the bottom right you se incoming power supply for the ULN2003, drive stage, the IC located in the middle. Below the IC is the parallell resistor net with a high power resistor to the outer most right of them. Figure 4, I used Multisim to model the electric circuit to see if the heating powers of the resistors were below the maximum specifications of them. I configure a PID control in LabView to control the heating of the filament with the measured temperature as feed back, a simple program that doesn't need to be shown here I think. This program is now linked to my other LabView program so I will get movie and logging capabilities of a heating experiment. I tested to heat up the filament, as can bee seen in the graph below, the temperature is considerably higher inside the TEM (vacuum) compared to outside were you will also have a cooling effect by the air. For air 680mA of heating current gives a temperature of 155°C, were inside the TEM this current level will give you a temperature of roughly 800°C. Figure 5, Measured temperature as function of heating electric current. Resistance curve is the modeled total resistance including the limiting resistors net. Voltage curve is the modeled applied voltage to the connector box. Heating power is the modeled heating power that the filament produces. The resistors I used earlier in this experiment were very old and after some running time they could not withstand the heat. So I bought new 2 Watts resistors, as seen in the figure 6. Figure 6, Resistors, right in picture, were replaced with fresh ones of 2 Watt type, except the 4W power resistor that was still ok. The new coaxial cable seen in this picture, compared with the last, is only used in an another type of experiment. I think this is wonderful I truly appreciate the information shared in this post I am going to bookmark this! I have bookmark your site for future updates. I’ve just replaced my combi boiler. The savings from the new system means the boiler pays for itself.